I have a new dayjob. It just sorta fell into my lap. I saw the ad and recognized that it would be perfect for me, and saved the page of the paper, but after I carried it into the office, I forgot about it for a couple of days. Until late the night before we were leaving town. So in the morning, after I finished packing, I took a few minutes and threw together something resembling a resume, slapped it in an e-mail and left town. That afternoon, I got a call from the lady, and by the time I hung up, I was pretty sure I'd been hired, although nobody ever quite said so in those exact words. However, when I talked to her again on Friday (again on the phone), we made arrangements for me to take the required drug test (I have caught a cold, and between that and my regular meds, there's no telling how that will turn out) and to come in for training. What will I be doing that makes this job so perfect? Basically, I will be a glorified typist. With clean-up duties. It's a part-time position at the local newspaper with the grandiose title of Editorial Assistant. (Newspapers are good at handing out grandiose titles. When I worked years ago as the only staff on a weekly paper (except for the guy who did sports), I was called "Managing Editor." But I still had to develop all the pictures I took myself--plus write all the copy and cutlines and whatever else needed writing.) I will type into the computer all the Community Bulletin Board items people turn in, so they can be laid out on the page. And whatever else needs doing. In other news, I have caught a cold and did not go to any Mardi Gras activities this weekend. I am halfway through my RITA books. Four more to go--unless they send me a second panel of books, which they have done in years past. (I do volunteer for them.) I also need to judge this other contest I volunteered to help with. And I need to send some pages to critique to my cps. We haven't critiqued any in the last few years, and I've missed it. But then, isn't interruption life's constant? This week has been the pits as far as getting any writing done. I think I got a page on Monday. Maybe two. It was a holiday for the fella, and he didn't stay gone as long as I thought he would. Tuesday, he had a meeting in Austin, so I went to visit the aging parents, and shopped for fabric with Mom for my costume for the Victorian Christmas festival. So, my costume is going to be red. Not a bright red, more of a dark cranberry red. The jacket is a jacquard upholstery fabric--the kind with texture in a floral pattern. But it will work for jackets too. The skirt is a darker red, almost maroon--I kept having to explain to Mom that no, I didn't want a white or cream skirt, even though that was what the pattern showed, because this festival is outdoors, and I didn't want to be dragging a white skirt through the streets--and the bodice will be an old-fashioned pink rosebud stripe (pink stripes alternating with pink and green rosebuds on off-white), so I think it will look very mid-Victorian-ish. The construction is VERY complicated, which is why I'm starting now. I've got eleven months to finish it. I've got six weeks to cut it out, before I can go get my sewing machine. So this is my project for the year, even though I haven't finished projects from previous years. I will probably be putting in the miles and miles of hem the Friday night before the event, knowing me. Ah well. Now I'll have to give a regular "costume report" too... (It's lined, both jacket and bodice, and interfaced, and there's supposed to be boning in the bodice, which I don't know if I will put in, but we will see...) Seriously, y'all, wish me luck. I did actually think about the writing while I was there. The aging parents are getting ready to move--even though they haven't actually put their house on the market yet--and have been going through their books. They found a copy of my old Master's thesis on China missions, and I read through most of it, checking on my research. A couple of things I thought I remembered, but couldn't confirm, I found in there--like the city on the Yangtze usually referred to as Wuhan is actually made up of three cities on 3 sides of the river (it's very river-y right there), Wuchang, Hanyang and Hankow--I don't know how they'd be spelled in the current transliteration, though. Anyway--I could remember Hankow, but couldn't remember what the other two cities were. And they had a huge world atlas where I looked up the maps of China to check on city names and geography of my story, etc. So I did think about it. Just didn't do any. Also judged a contest. Haven't done any writing today either. Had a dentist appointment this a.m. and now have very clean teeth, and no need to go back for more work. (YAY!!) Other things are developing--but I'll share when I know more. As in, I need more of it! It's running away and I can't catch it! ANYWAY. Life has absolutely NOT slowed down. Made a mad dash trip to Fort Worth last week for a nephew's Eagle Scout court of honor. It was great. Everybody in this picture, except the guy behind the guy in the red shirt, is a relative. And all the guys are Eagle Scouts. Now see, to me, that is what constitutes an Alpha male. Eagle Scouts are quintessential alpha males. They are leaders and protectors, but they're not arrogant SOBs, because most of the time, you can't be a real SOB and get people to follow you. There's a difference between expecting and inspiring people to do what they're supposed to do and browbeating them into doing what you want or controlling their every move. Admittedly, I've met a few Eagle Scouts who tend to get a little controlling, but very, very few, especially given the number of Eagles I know. 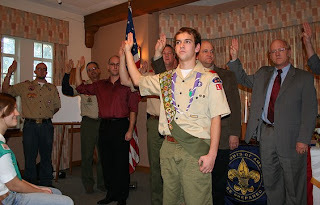 In order to become an Eagle Scout, not only do they have to earn the requisite number of merit badges (which isn't an easy thing), but they have to plan and lead others in a service project, which can range from painting fire hydrants to demo work on old, dangerous church playgrounds. They're not supposed to do the work themselves, but organize the troop and the community to do it. And believe me, teenaged boys aren't going to put themselves out for an arrogant jerk. If a guy can get past his "jerk" phase as a teenager, usually he's not going back to it later on. I have to go early, because if I don't get across the causeway by 4:30 at the latest, I can't really get across till around 6:30 because of rush hour traffic. I barely made it out in time. And it was raining. But I spent my time usefully. I picked up a pattern for my costume for next December's Victorian Christmas festival. (Knowing how slow I am, yes, I have to begin now.) I bought some fabric remnants to use for "green" Christmas wrapping. I bought some books. And of course, when it was time to head to the meeting, it was still raining, and there was a wreck backing up traffic. (sigh) Anyway, it was a great meeting. Colleen Thompson gave a terrific talk on emotional impact from the very beginning. And then I went for a "nightcap" with some of the other members. I didn't get back to my island before midnight. (It is a pretty long way to where we meet...) But, since it was still raining, and a lot harder than it had been, I got wet coming in the house, and stayed up a while to finish my book and dry off. So I was up really late, which made me next to worthless during my Wednesday writing time. (See, there was a point that tied back to my main point, which has to do with time.) I was pretty much worthless all day Wednesday. The only thing I accomplished on my daily list of things to do (very low tech, kept in a little, fat notebook) was to write four pages. At least I did get four. So today, I had a LOT to catch up on. Updating the website. (It is updated! With new pictures!) Making a dentist appointment. (I think I have a filling coming out.) Paying RWA chapter dues. (I'm a member of 6 chapters. (Ack!) Three land-based and three online.) Buying caffeine free Dr Pepper for the inlaws visit starting tomorrow. Joining the Art League. (I haven't painted a thing in 5 months, and I miss it!) I even handwashed all the dishes, because the dishwasher still isn't repaired. Oh, and I also got 6 pages written. I had to persist and crank and make myself not look stuff up in research books, because even on the days I got more written, I caught myself procrastinating. I would realize that I wasn't writing, I was looking at a map of the island that just happened to be sitting on the card table where I write first drafts. (We haven't moved the desk down yet.) Or pick up a research book to look up a name and catch myself reading the parts of it that I hadn't read and that didn't really apply to my book. Today, I did a little better, but it was still tough, because I finished the scene I knew about, and didn't exactly know where to go next, but I kept going anyway and made junk up. That's what writing is, right? Making junk up. So, I have 5 more pages to write tomorrow to earn my charm. I have to write 5 more than that (10 total) to make my goals for my "procrastination" loop, and I don't know if I'll make the ten. With company coming, I won't really be able to write over the weekend, and I'm planning a trip to visit my forgetful parents next week... I don't have time for a dayjob! Okay, so all I can do is gut it up and keep working. Think "Buy" thoughts at all those editors out there for me, okay? Oh! Hey, look--I'm on somebody's "Top 20 list"! :) How verra cool!! In other news, everybody has gone home--even the boy and the granddog. My brain is beginning to function again, and I'm trying to get back in the swing of writing and running errands. We did So Much during the holidays. We went to the submarine and the destroyer at Seawolf park over on Pelican Island. We rode the ferry over to Bolivar and back--it was a pretty good deal--free, and it had an outside walkway upstairs that the grandboy could run track on and mostly not escape. He did look at the boats and the water now and again--lots and LOTS of boats heading into and out of the ship channel. The Bolivar ferry crosses the main strait there. We even saw a few dolphins--not that the little boy looked, but the big kids got pretty excited to see them. We went out to the beach on one of the warmer days--which was still darn cold, especially since the wind was blowing like crazy out of the north. 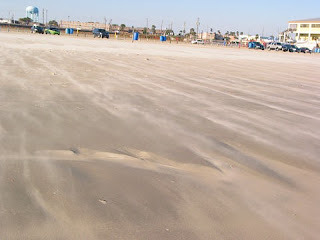 You can see how the sand was blowing--like snowdrifts, toward the water. 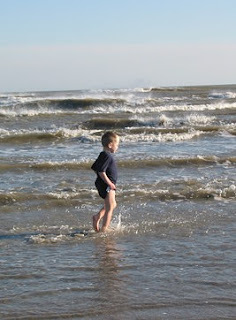 And of course, the grandboy had to run along the water's edge...and then turn and run the other way. And then run back the other way. And he kept getting deeper and deeper and deeper into the water. And BOY, was it cold. He was turning blue and red and other not-boy colors, but he LOVED the water, and did not want to get out, even though he eventually got up to his waist in that cold, cold water. He had to be carried, kicking and screaming, out of the water. So, anyway, we had a great time. (We even took him back to the beach on another, warmer day--water was still cold, maybe colder--and he had to be carried out of the water then too.) But it was really busy, and in the middle of it all, the dishwasher gave up the ghost. It just flat DIED. And with six people still here, that meant a lot of cooking, and a lot of dishes to wash. I think the death of the dishwasher was kind of the last straw for the fella. They are fixing it, but it's the timer that's out (the thing won't even drain), and it's taking a while for the part to come in--and the first time it came in, it didn't work. Anyway, a new rental opened up in one of the nicest parts of town for very little more money, and no stairs to climb to get in the house. So we're moving again at the end of the month. And moving all our furniture down here probably during spring break. Going to be lots of distractions in the weeks ahead, so I have to write, write, write. Or try to. This week, I've started typing in Thunder in a Cloudless Sky, the WWII/China story, to get my head back into the story. Next week, I'll start writing on it again. I'm going to have to decide what story I want to complete this year and which partials I want to try to revise. I do want to finish a partial for the futuristic, Time Catch... I'll just have to see what happens, I guess. Beach report: I went out to walk on the beach, but turned out it was high tide, and the tide was so high, there was no room to walk. It was almost all the way up to the seawall. So I walked along the sidewalk a ways, and when I got back to the house, my hair had been waved into ripples by the humidity. Yesterday, I had to drive back and forth down the seawall a couple of times, and there was a fog rolling in off the gulf. You could hardly see past the surf, and cars and stoplights were pretty dim, and yet the fog was really bright, because the sun was shining. And only a few blocks away, mid-island, maybe, there was no fog or mist at all. It was really kind of cool. 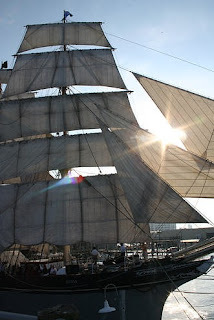 I'll leave you with a picture of the "pirate ship's" sails.